So your floors are covered with carpets to give that warm and cosy feeling to your house? Did you know that the carpets are one of the dirtiest areas in your house? Well, it stands true if not cleaned regularly, it becomes the breeding ground for dust mites, allergy causing germs, mould, fungi that lead to polluted indoor air and finally resulting in illnesses. You may be using a vacuum cleaner to pull out the immediate dust and dirt but it isn’t cleaned from deep within that gives a rise to problems. Well, your fear can come to your end with us coming to your rescue. Fantastic Carpet Cleaning providing customers residential carpet cleaning services in Arncliffe, with a low cost, more effective alternative to traditional "ECO FRIENDLY" carpet cleaning methods which one is safe for you as well as your pets. Fantastic Carpet Cleaning started off with a purpose to provide fast, friendly, efficient, 100% satisfaction guaranteed carpet cleaning services to all of our customers. We are known to use the world's No. 1 carpet cleaning technology which is ROTOVAC. We are equipped with industrial quality cleaning equipment, carpet extractors, cleaning liquids thus ensuring that your receive nothing but the best services. Right from dry carpet cleaning to steam cleaning, we do it all depending on the type of carpet your floors are adorned with. Here is a detailed discourse on how we undertake tasks. The moment you hire us to help you with carpet cleaning services, we come over with a team that conducts the necessary inspection. The assessment includes checking the type of carpets laid, the areas covered, the amount of dirt that it has collected and the type of treatment it would require ensuring that it is cleaned from deep inside. While this is done, we also keep in mind the fact that the carpet’s sheen isn’t damaged. If we are to make use of steam cleaning for your carpet, that is because your carpet needs deep cleaning and there is the need to get rid of the soil and dirt that has been accumulating. While we do so, the soil is to come in contact with moisture thus creating mud. To prevent this, we would conduct a pre-vacuum session that pulls out the loose dust from your carpets and thus making the later stage easy. This involves the use of spotting liquids that breaks down the enzymes that the carpet stains contain. Whether it is from pet urine or spilled coffee, we ensure that the stain is removed completely and only them the cleaning process can start. While the enzymes of the spill stains are broken down, it is easy for the difficult-to-get-rid of stains to be removed completely. 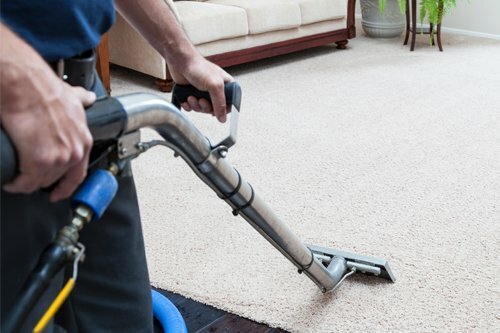 Even though we conduct effective pre-vacuum for the carpets, only the loose dirt is extracted during the process. While we intend to get rid of the dirt embedded in the fibres, we make use of pre-spray chemical. This chemical is known to dislodge and breakdown the firmly caked dirt from the carpet fibres thus allowing the dirt removal process to be easy. As stated earlier, we make use of industrial quality steam cleaning equipment. With a combination of carpet-friendly cleaning liquid and hot water, the cleaning equipment emits steam to ensure that the carpet is cleaned from deep within especially after the loose dust is vacuumed. Even though we undertake the carpet cleaning process seriously and ensure that each step is taken care of in the best way, we perform post cleaning inspection to ensure that your carpet looks and feels just as new. Right from ensuring that the texture and quality of the carpet is retained to checking for the absence of the dust in the carpets, we do it all so that you are satisfied with the results. Carpet cleaning with the help of cleaning liquids and equipment especially the steam ones can leave a smell especially when the rooms aren’t aired well. Therefore, we ensure that the rooms are deodorised after all carpet cleaning services that we offer to ensure that you get to live comfortably without encountering any sort of stench and the best part is that is a complementary service that we offer to you.